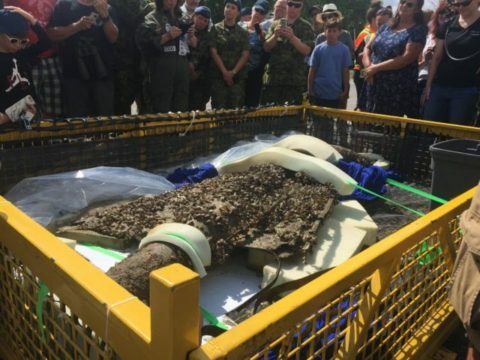 Crews have recovered the first model of the Avro Arrow from Lake Ontario. The models, which were used to record the flight characteristics of the CF-105 in free flight tests in the 1950s, were propelled by rockets and sent data back to a ground station by radio telemetry. The models were considered expendable and were never intended to be recovered but the historic decision to cancel the program and destroy the first five full-scale aircraft revived interest in the models. The recovery effort was led by a group called Raise the Arrow and was supported by the Royal Canadian Navy dive team and the Canadian Conservation Institute. The model will eventually be displayed by the Canada Aviation and Space Museum. Meanwhile, a more modern tribute to the Arrow legacy is in danger in Toronto. The Canadian Air and Space Museum at Downsview Park built an exact replica of a full-sized Arrow a decade ago but when it was forced out of its space there the big model was put in an outside storage yard at Pearson Airport. The model is deteriorating rapidly under a tattered tarp and there is a movement to save it from further damage. Toronto Mayor John Tory has said he’ll see what the city can do to get the model out of the elements.